sizes: 28, 35 and 55 mm. Antioxidation treatment is available upon request on every version. Rails can be machined with two straight cuts, one straight and one slanting cut or two slanting cuts. These options allow to create joinable versions, and thus obtaining longer strokes. The aluminium slider can be configured with a variable number of rollers with steel pins, ranging from 2 to 6. Rollers are in turn available in two variants, cylindrical or V-shaped, with variable diameter from Ø30 a Ø62 depending on rail size. Speedy Rail beam is a heat-treated aluminium alloy profile with hollow cross-sections which makes it very strong under torsion and deflection stresses. Beams are then subject to a special patented treatment which provides a smooth, hard (700 HV) surface comparable to tempered steel. The fusion point of the non-stick surface layer (2100°C) permits an excellent resistance to welding splatters. For these reasons the Speedy Rail® beams and components are widely used in the automotive industry to build transfer systems (lift & carry) for automated welding lines. 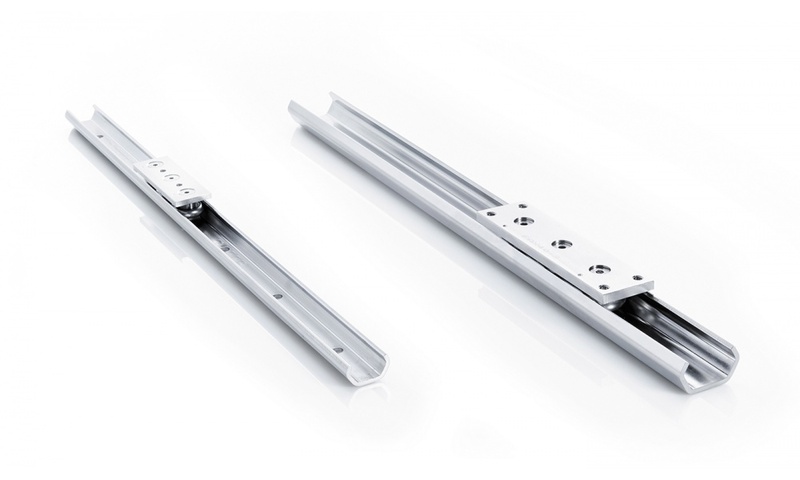 The roller linear system O-Rail offers the maximum flexibility configuration due to the original shape of the guide with 3 raceways arranged at 90 ° to each other where on each of those can slide rollers R..43G series. 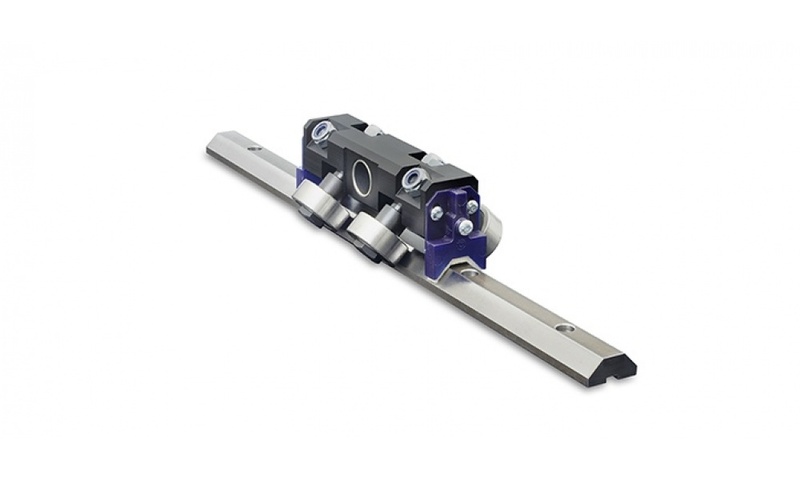 Using a single guide, two, or more parallel guides, gives rise to a number of combinations capable of satisfying each specific need for linear motion and offering exceptional self-alignment capacity. O-Rail is constructed in high strength steel hardened with hardening treatments, for a further improvement of both performance and durability. 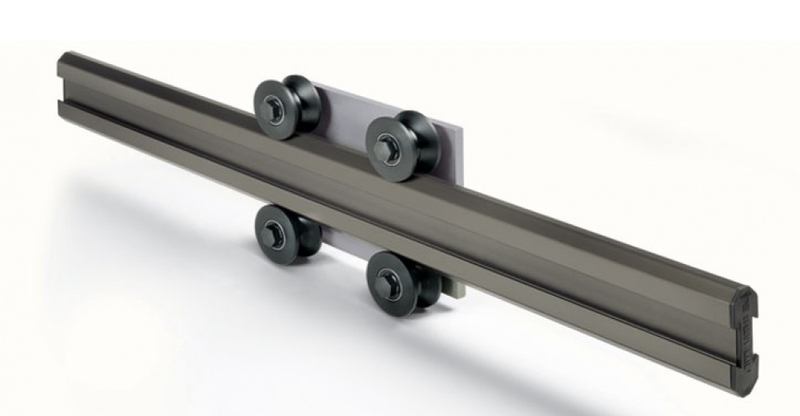 O-Rail is designed to be a strong and simple multitask linear system for larger handling and automation applications. It is an easy to assemble system, that offers smooth motion even on inaccurate surfaces. The running grooves are ground in semicircular profile and have a contact angle of 45° in X-arrangement so that the same load capacity is guaranteed in all principle directions. Use of large steel balls enables high load and moment capacities. All carriages in size 55 are equipped with ball chains. 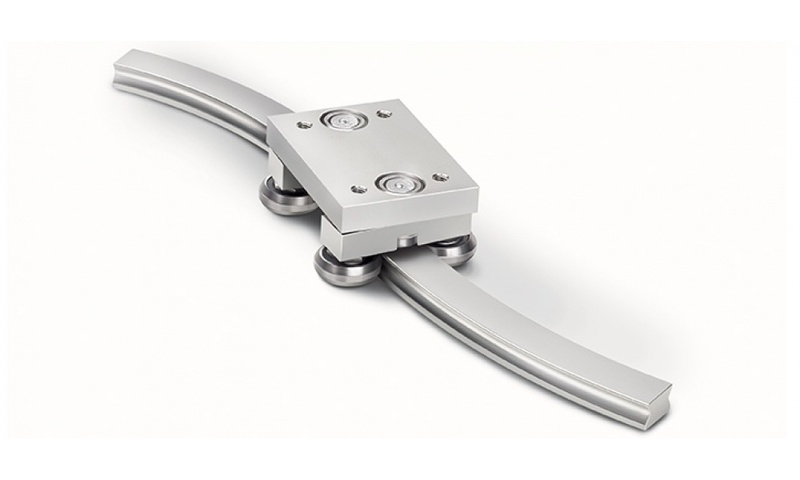 The CPC ARC/HRC Linear Guide Series uses the O-type arrangement for the four row ball circulation design which can absorb larger torque from Mr direction and the contact angle between the rail and balls is 45 degrees which can realise the 4 directional load effects. In addition, the runner block for the same size uses larger balls, so it will outperform competitor’s models by 10% to 30% regarding load capabilities. The runner block is designed with simple and compact accessories which provides plenty and thick space for the steel body and enhances the entire rigidity of the runner block. The product have characteristics of high load, high moment, and high stiffness. 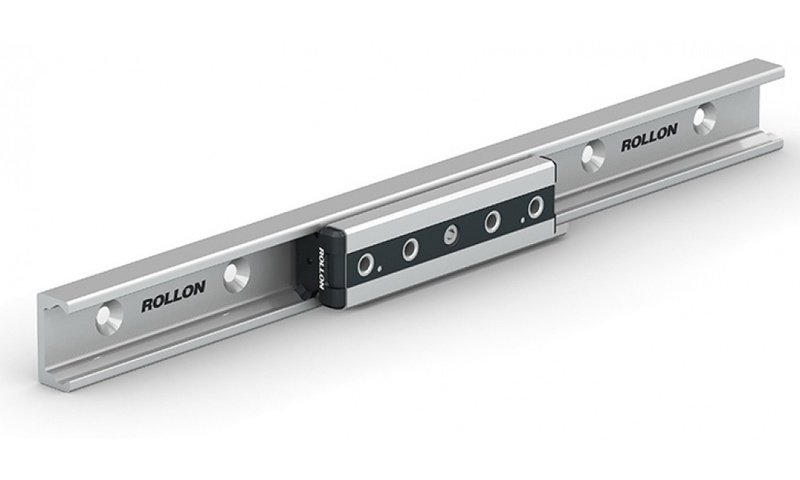 Rollon’s Compact Rail is different from all other linear bearing systems available in the market and is a simple, precision, linear bearing system that is easy and inexpensive to mount to all – even non-machined- surfaces. What’s more, Compact Rail will self-align to another rail if mounting surfaces are not perfectly parallel and is a fast (up to 9 m/s) and silent. Embedded inverse hook design for reinforcement mechanical integration when block is in motion, the steel balls circulating inside the raceway during direction change movement it generate impact force to the plastic end cap. As the demands on rapid motion automation industry has increase. CPC has invented new design to improved high speed running capability. New designed plastic inverse hook for miniature linear block, tightly secure block components to handle the impact force. ST Miniature Stroke Slide series incorporate with the design of two rows of ball. The ball track has Gothic profile design with 45 degree contact angle to attain the effect of equal load capacity in all mono block provide more space for larger rolling elements, enhance the load and moment capacity. This series is a simple and cost effective linear bearing for applications where good load capacity and corrosion resistance are most important. The following are many advantages that the product offers in almost all applications: corrosion resistant even after scratching, etching and chipping; can be used in washdowns; resistant to high temperatures and temperature changes; ecological and recyclable materials. 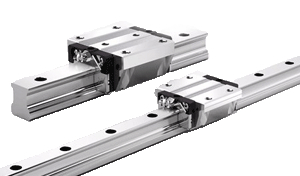 Rollon’s Curvi Line is the cost effective linear solution for applications with linear movement that isn’t always strictly linear. It is a custom solution made according to the application needs and is obtained by an innovative manufacturing process which allows manufacture small quantities (100 pcs) in a cost effective manner. 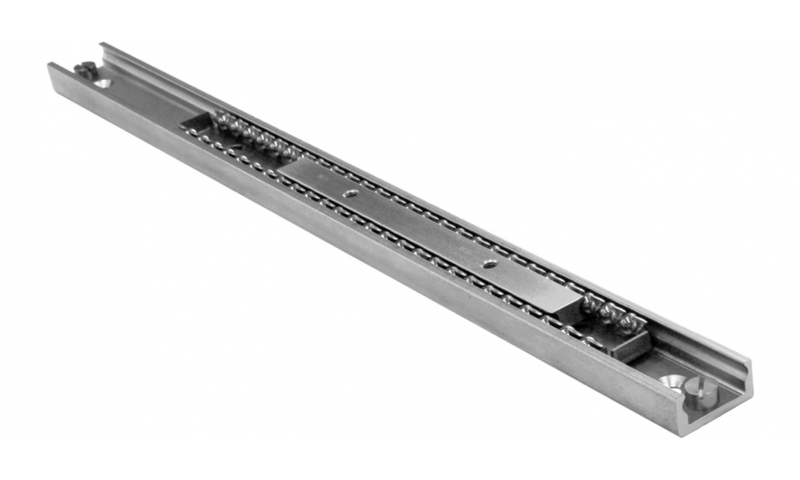 The Easyslide series is a system of drawn steel linear rails with induction hardened raceways. 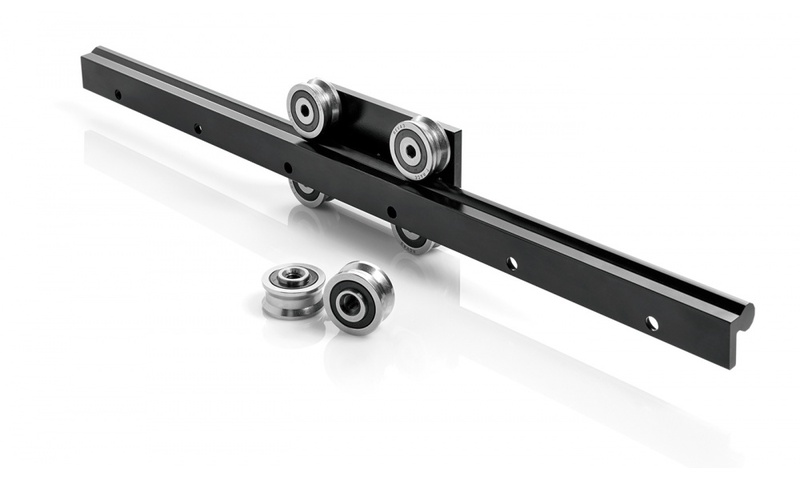 The system consists of an “C” shaped linear profile rail, and one or more internal sliders with caged recirculating ball bearings.